The May 2015 Leo horoscope forecasts warn that you have to balance your self-will and social grace. This is because the planetary patterns are distributed equally in both Eastern and Western spheres of your horoscope. Sometimes you have to assert yourself. At other times you have to be flexible and adjust your requirements to the situation. In May 2015 the Lions will see important changes when it comes to family and domestic affairs Repairs and renovations in your residence are likely. On the personal front, your attitude towards family members should be examined and corrected. Religious and spiritual interests will be questioned. The career prospects for the Leo zodiac sign for May 2015 foretell that you will finalize your professional goals and the line of action to achieve your targets. Your office environment will be pleasant. You will be happy with your present status at your job. You will get promotions and financial rewards. Good communication with business associates and superiors is essential. 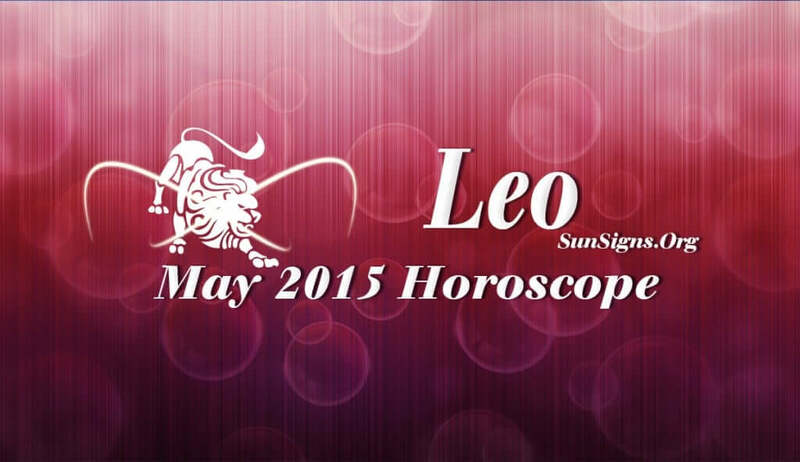 The Leo 2015 May horoscope forecasts that finances will be fabulous during the month. You can avoid speculative investments and put money in projects involving creativity for better future. Money will come through social contacts and organizations. The horoscope 2015 predictions forecast that you can expect monetary windfalls during the month. Single Leos will find love while dating on the internet in May 2015. After 20th, relationship with your spouse will be harmonious and existing problems will be resolved. Sexual compatibility between Leo couples will be exceptionally good. This is a good time to plan a pregnancy. The May 2015 Leo horoscope predictions show that health will gradually improve till 20th and after that you will have plenty of vitality. All existing ailments can be cured with alternative healing like Rudraksh therapy or crystal healing. All illnesses will disappear and you will be a new person.